The new Amonkhet set welcomes us to the opulent world of the same name. The might and majesty of the God-Pharaoh is all around. 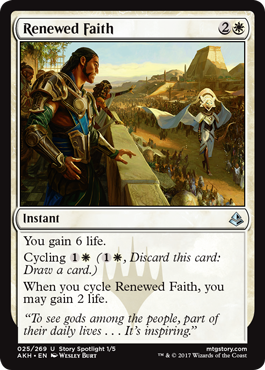 Most residents of Amonkhet have one mission in life: prepare for a glorious afterlife. Death is all the rage here, and the new abilities in this set put the graveyard in the spotlight. To undergo the five trials of the Gods and become worthy, an initiate must hone body and mind. The demands on you are a bit lighter: sit back, relax, and enjoy what Magic experiences await. Welcome to Amonkhet. The dead are so useful here! They cook. They clean. They write preview articles for strategy card games. Mummies are at the very heart of life in the city of Naktamun. The new embalm mechanic breathes unlife into some creatures after they die. I won’t keep this new ability under wraps any longer. Here’s Anointer Priest. Embalm is an activated ability you can activate if the creature card with embalm is in your graveyard. Notably you’re not casting the card from the graveyard, so things that counter spells won’t work against the embalm ability. The original creature spell can be countered, of course, but that just puts the card in the graveyard. I think you see where this is headed. To activate an embalm ability, simply pay the embalm cost and exile the card. You do this any time you could cast a sorcery, meaning during your main phase when nothing else is happening. When the ability resolves, you create a token copy of the card, but as you’d expect, going through the process of mummification causes some changes. It’s got that whole undead thing going on, so it’s a Zombie in addition to whatever creature types it used to have. You’ll find lots of ways to take advantage of its new zombiehood, I’m sure. And now that it’s all service, all the time and doesn’t care about whatever it was it cared about while alive, it’s white instead of whatever color it used to be. One more minor change is that it doesn’t have the mana cost the card has. So it turns out that after you’re made into a mummy, you look pretty badass. Like a movie villain or something! We don’t usually make tokens for cards that make token copies of themselves, but this was an opportunity too sweet to pass up. Thus, each creature card with embalm has a corresponding token. You don’t have to use the token if you don’t have one or just don’t want to. But you should because they’re great. Now that we’ve taken a glimpse into what the dead are up to on Amonkhet, let’s check in on the living. They’re training. Obsessively. To capture this extreme worth ethic, we have the new exertability. Exert allows creatures to give a little more effort to produce unusually good results. You make the decision whether to exert a creature as you declare it as an attacker. If you choose to have it exert, an ability will trigger and grant you some bonus. As a trade-off, the creature won’t untap during your next turn. It’s tired. Needs a nap. Attack more later. We’ve hit up the living and the dead. Let’s see how amorphous manifestations of mana are doing! The new aftermath ability lets instants and sorceries in on the graveyard party with a new twist on split cards. If you’ve never seen split cards before, here’s a quick refresher. They’re two cards in one. As you cast a split card, you choose which half you’re casting. While the spell is on the stack, the half you’re not casting is just ignored. Aftermath takes the concept of choice and turns it on its side. It’s other side. Never mind. We’ll call Destined the “top half” for our little chat today. You cast Destined and when it resolves, it goes to your graveyard like any other instant. Now that the card is in your graveyard, you can cast Lead. Casting the “bottom half” is just like casting any spell: you pay costs, it goes on the stack, it can be countered, and so on. You just do so from the graveyard and after that half resolves, the card is exiled. You can cast both halves of an aftermath card in the same turn, or you can space it out and have the card sit in your graveyard for a few turns. The innovative orientation helps here. If a card with aftermath is hanging out in your graveyard, you can rotate it counterclockwise 90 degrees, and the castable half will now be staring at you. From the grave. With cold, piercing eyes. Okay, moving on! The popular cycling ability returns in this set because nothing is more important than finding the right card for the situation and oh, by the way, filling up that graveyard. Cycling lets you trade a card in hand for a new card. Maybe your opponent doesn’t have any good targets for Limits of Solidarity, or maybe you’re just good on life for now and need to find a threat. Whatever the reason, cycling a card gives you another shot and finding what you need. Cycling abilities work while the card with cycling is in your hand. Each cycling ability has a cost, usually mana, but we like to be creative sometimes. 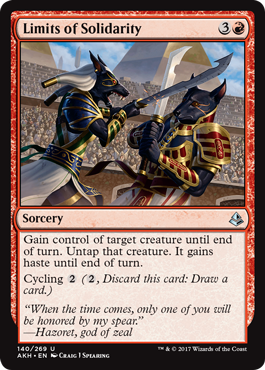 To activate a cycling ability, pay that cost and discard the card with cycling from your hand. The effect of each ability is the same: draw a card. But you’ll find plenty of additional effects if you know where to look. 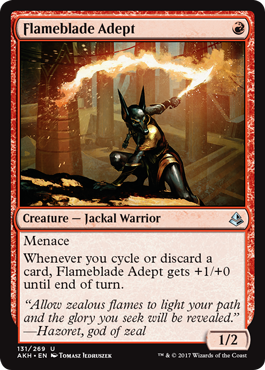 Cycling a card will cause Flameblade Adept’s ability to trigger only once. The “cycle or discard” clause is there to make sure all discards—cycling and otherwise—will net you a bonus. Would it surprise you to learn that a world obsessed with death has mastered several tools that cause death? Didn’t think so. -1/-1 counters are fairly straightforward. 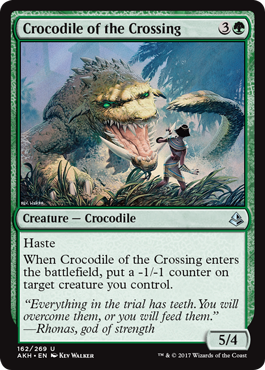 Hardly worth including in an article like this unless I had a cool preview card to show you with pleasing art to look at—OH SWEET MOTHER OF . 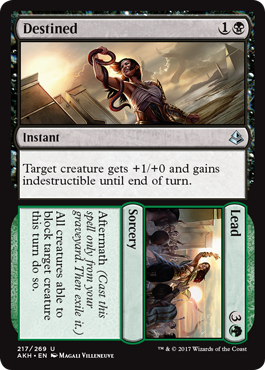 . .
Because Amonkhet has -1/-1 counters running around, you won’t see any cards in the set feature +1/+1 counters. But there are plenty of cards in Standard and other formats that do include +1/+1 counters, so you should know what happens when -1/-1 counters and +1/+1 counters meet. In short: total annihilation! If a creature (or any permanent, technically) ever has +1/+1 counters and -1/-1 counters on it, they cancel each other out and are removed in pairs. For example, if a creature has four +1/+1 counters on it receives two -1/-1 counters, the end result is a creature with two +1/+1 counters. If you put the -1/-1 counter on Rishkar, the Peema Renegade will lose its handy +1/+1 counter and won’t be able to tap for mana. Why would you do that? 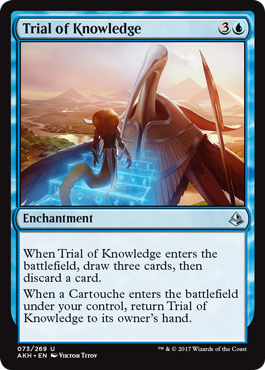 On Amonkhet, initiates earn Cartouches as a record of their deeds and accomplishments. They exhibit success in the five trials and are quite the fashion accessory to boot. Cartouche is a new Aura subtype found on a cycle of these magical merit badges. 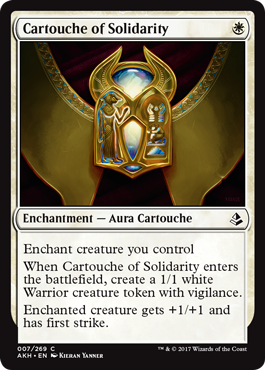 From a rules perspective, the Cartouche subtype is fairly unremarkable. But we wouldn’t add an Enchantment subtype unless something cared about them. You now know that everything leads up to the five trials. Including this article, as it happens. Face the trials! The Prerelease is almost here and with it your first chance at glory in the world of Amonkhet. Until then, enjoy all the great preview content prepared for you. Study and grow strong, for only the worthy among you shall attain the afterlife promised by the God-Pharaoh.